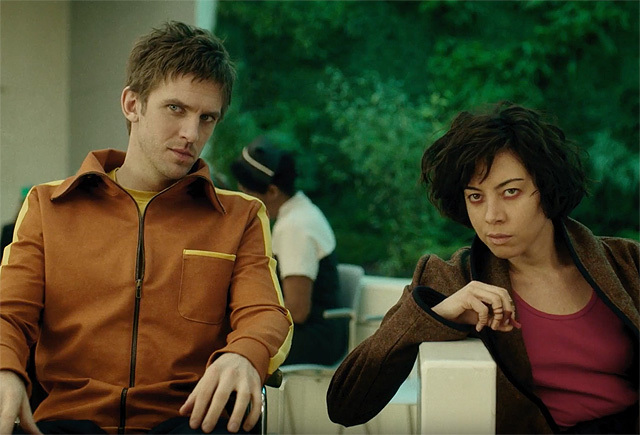 Legion Chapter 1 Recap - Schizophrenic or Mutant? 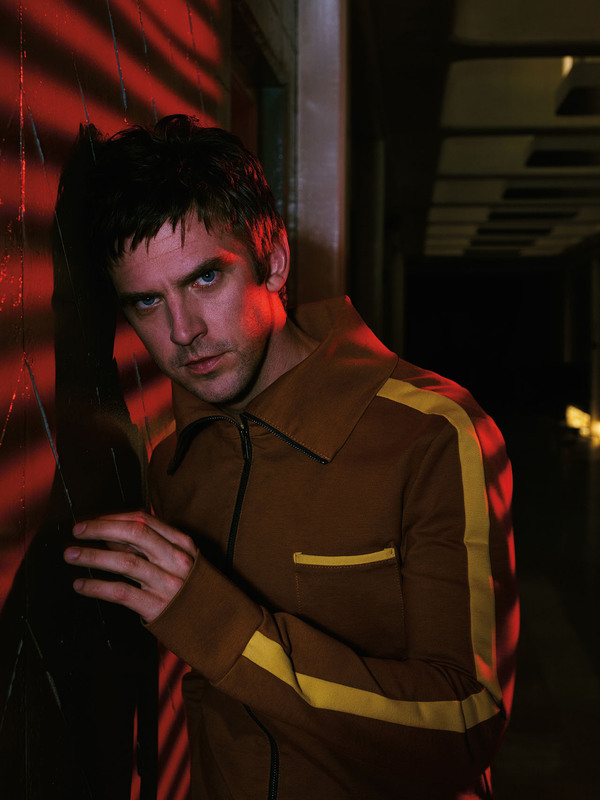 Legion Chapter 1 Recap – Schizophrenic or Mutant? David is a mentally unstable young man. In a montage, we see him setting a chemistry lab on fire, getting into a fight at prom, is arrested during a riot. The final straw, as we discover through the course of the pilot, is an argument that ends with the kitchen exploding around him and David trying to hang himself. When we first meet David, he is a patient at Clockworks Psychiatric Hospital. He has been diagnosed as a paranoid schizophrenic, and while that may or may not be true, he definitely has extreme telekinetic powers that he doesn’t really understand. 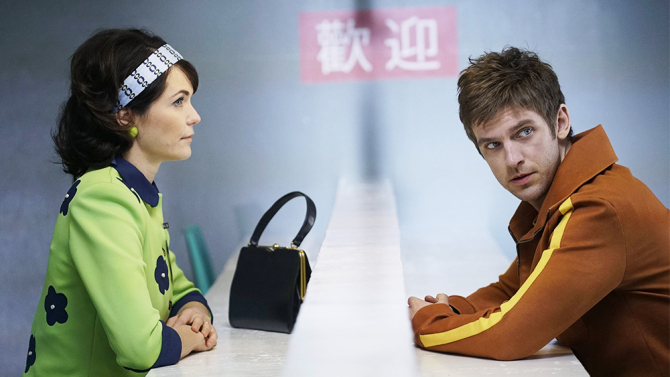 The time period is uncertain: the sets and costumes look like 1960s mod, and David at one point uses a pay phone, but one of the characters references CNN, which didn’t exist until 1980. Also institutionalized with David is a girl named Lenny and a girl named Sydney. David is taking with Sydney, who agrees to be his girlfriend, on one condition: that he never, ever touches her. Sydney suggests, one day during group therapy, that David is there because someone said he was “not normal.” “What if the problems aren’t in your head?” she challenges. In addition to voices, David has horrible dreams that frequently include “the devil with the yellow eyes.” This is a short, fat humanoid who looks like a potato to me. We time-jump, to “now.” David is speaking with someone who he is told is a police detective – but he obviously isn’t. He is questioning David about an incident that took place in the hospital, where David was a patient for six years before “escaping.” The nameless “cop” claims that there is no record of a Sydney Barrett at the hospital, and wonders if she is all part of his delusion. David is adamant that she is real. His brain is a little fuzzy right now, he has been off his meds for a while. The interrogator agrees to a break, and we discover that the “interrogation room” is actually a set inside of a drained gymnasium swimming pool. In the gym proper, government soldiers are arming themselves and an older man is watching the interrogation on a sophisticated video system. The observer wants to know if he is crazy; the interrogator thinks David is telling the truth. “He knows he is crazy, but part of him knows the power is real.” While the scope of David’s powers is unknown, the interrogator believes he may be the most powerful mutant they’ve ever seen. The observer says that Division 1 thinks they should kill David; the interrogator wants until the end of the day. The interrogator returns to David with a machine, wanting to read his brain while they talk. David is tired of this and wants a lawyer; the interrogator just wants him to remain calm. David realizes he holds the power when he figures out they are afraid of him. He agrees to have electrodes placed on his head and continues to tell him about the “incident” at the hospital. Sydney is being released from the hospital, and she is sad because David isn’t there to say goodbye. As she is leaving, David rushes to say goodbye. She is relieved to see him – until he leans in and kisses her. There is a spark, he sees a field filled with televisions, and both are knocked backwards. David is dragged away, screaming, while Sydney is taken to the infirmary. The entire hospital is on lockdown, and while Sydney calmly holds an ice pack to her head, her doctor rushes to help the staff with David, who is going bonkers. Left alone, Sydney is shocked by what she sees. It is David, in Sydney’s body. Which means it is Sydney in David’s body, with David’s powers of telekinesis, and she is freaking out, causing David’s powers to go haywire. The doctor walks down the hall and enters the common room, which is awash in a red light. The room is completely empty, devoid of humans and furniture. “Sydney” follows the doctor down the hall, following panicked screams. The hallway is devoid of doors. The room numbers are still on the wall, but the doors are gone, replaced by solid drywall. The screams are coming from people who are now trapped in their rooms. One person isn’t screaming: Lenny. She’s dead. She was trapped halfway in her room when the walls sealed up. “David” is also sealed up in his room, screaming his own name. The doctor hurries “Sydney” out of the hospital, telling her she may not get another chance to leave. She insists she isn’t Sydney, but is distracted when a sleek car pulls up, and a nattily dressed couple get out. A third person gets out of the car, and doesn’t turn around. Flipping back to the “now” narrative, David accuses the interrogator of being at the hospital. The interrogator insists David is wrong and tries to change the subject, but David is adamant. The room trembles and the interrogator’s pen impales itself in his cheek. In the observation area, the older man orders his men to use the gas, and everyone mobilizes. 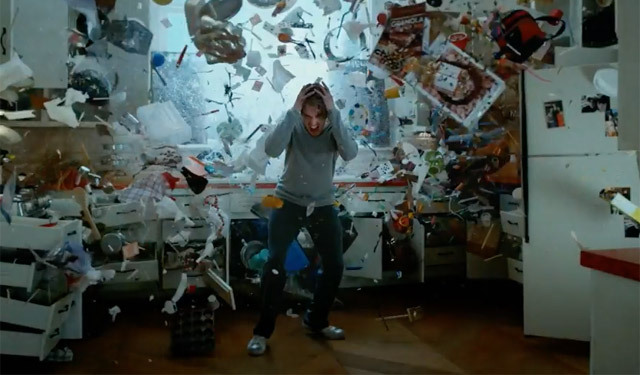 David’s powers throw everyone in the room back against the wall, and turns the desk into dust. He looks pretty satisfied with himself – then the gas knocks him out. David’s story continues in his dream. “Sydney” is sitting at a cafe, remembering David’s memories. Then it is David sitting there, physically and mentally. He feels his chest and realizes he is back to himself. Armed with Sydney’s suitcase, David goes to his sister Amy’s house. She is stunned to see him, but welcomes him and sets him up to stay in the converted basement. Lenny — the ghost of Lenny — visits David, promising that she’s not mad. She knew it was a “passenger” riding in his body and acknowledges that she didn’t have much to expect from life. She warns him that “they” are coming and are going to kill him, which upsets David. The lamp flies across the room, bringing Amy down to check on him. He assures her he is fine, but even still, she takes all of her husband’s gardening tools. David sleeps and dreams he and Sydney are doing a Bollywood dance number in the hospital. David wakes up in the current narrative, with the interrogator, but he has been moved. He now sits in a tall metal chair, in the middle of the swimming pool. It is now filled with water, and the interrogator stands nearby, holding onto a switch. “Let’s not pretend. If you try anything you are going to get 100,000 volts.” David laughs at him, insisting this is all his delusion. The interrogator says “they” came to the hospital, and took Sydney thinking she was David. “We want her too,” he insists, and threatens to electrocute David if he doesn’t tell him where Sydney is. David insists he doesn’t know – he went looking for her and she was gone. In another flashback, David calls the hospital from a payphone, and finds they have no record of Sydney. The two people who arrived at the hospital come towards him, and he takes off. They follow him. Sydney appears, and insists that she is not really there; this is his memory. “They” can’t track them here. She explains that he is in government facility and the men speaking to him are not cops. She instructs him to slide out of his chair, into the water, and stay there until he sees her. David is back in the now, and the interrogator starts drilling him on who the third person was at the hospital that day. David realizes it wasn’t the interrogator, but a woman. Everyone is starting to get antsy as the interrogator asks once again where the girl is. “I think you’re about to find out,” he says, and slips from his chair into the water. The guards start firing and there is a huge explosion. David remains submerged, even as charred corpses float by. He surfaces and finds Sydney, flanked by the two people from the hospital. She helps him out of the water and reminds him not to touch her skin (she is wearing gloves), then introduces him to her companions: Kerry and Ptonomy. The quartet run outside through a hole in the wall, where they discover a war zone. They dodge missiles and guns and a mission leader, complete with powers, leads them down a hill to the rendezvous spot. David stops Sydney and begs to know: “Is this real?” She assures him it is real, that she is real, and she loves him. Sydney introduces David to Melanie Bird, who was the third person to get out of the car at the hospital. She extends a hand to greet him, and David looks at it warily. Behind him he sees the potato man with yellow eyes. 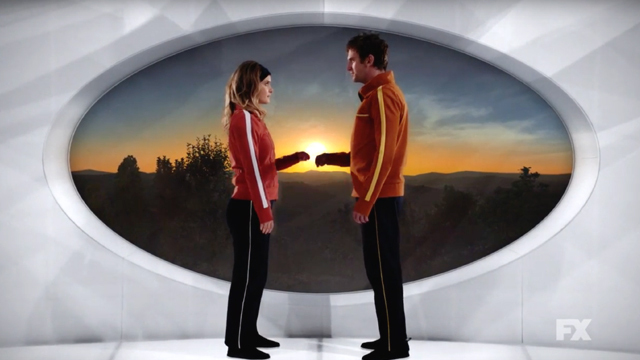 David shakes the vision from his head and takes Melanie’s hand.